The Foton-M #4 satellite is a microgravity research satellite that transports a variety of experiments from several fields of science to space for a two-month mission before returning its re-entry capsule to Earth to allow post-flight analysis of the scientific payloads. Foton-M #4 represents a modified second generation Foton satellite using a different Service Module than the previous three Foton-M satellite that were launched in 2002, 2005 and 2007 – however, the 2002 launch ended in failure. The Foton program dates back to 1985 when the first material science satellite of the Foton series flew under a military designation. In later years, payloads of foreign space agencies were hosted on Foton satellites. In total 15 Foton satellites were launched over the history of the program. The Foton and Foton-M satellites share commonality with the Bion and Bion-M spacecraft that are primarily dedicated to space-biology research, however, payloads dedicated to all fields of science have flown on both satellites. 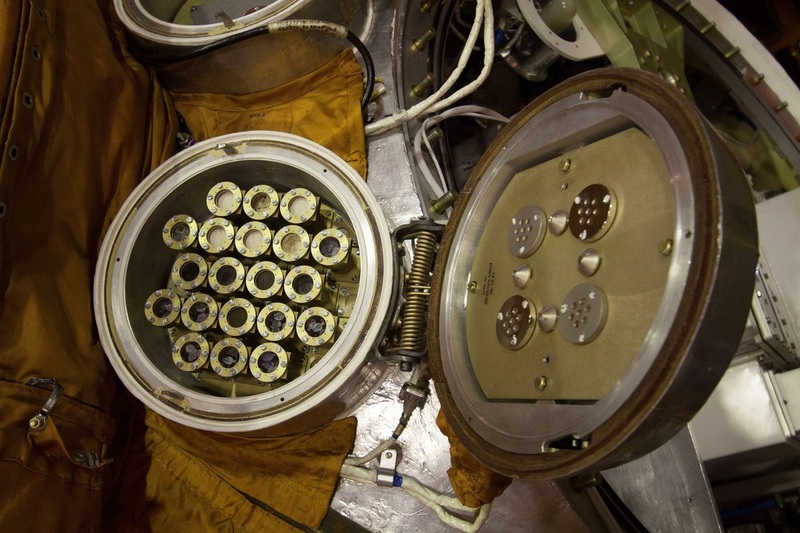 Both programs use heritage components developed for the Vostok manned space capsule such as the characteristic spherical re-entry capsule that has not changed much since the 1960s to build a robust system for bringing payloads into space and returning them to the Earth. Foton-M #4 is the first Foton-class satellite to switch from the three-segment design of a Battery Module, Re-Entry Module and Service Module to a two-segment design cutting the battery module as solar arrays are now used for power generation – enabling longer mission durations. This change is accompanied with a switch in service modules as the Foton-M #4 and #5 satellites transition to a Yantar-type Service Module which in this form is also used on the Bion-M satellites. 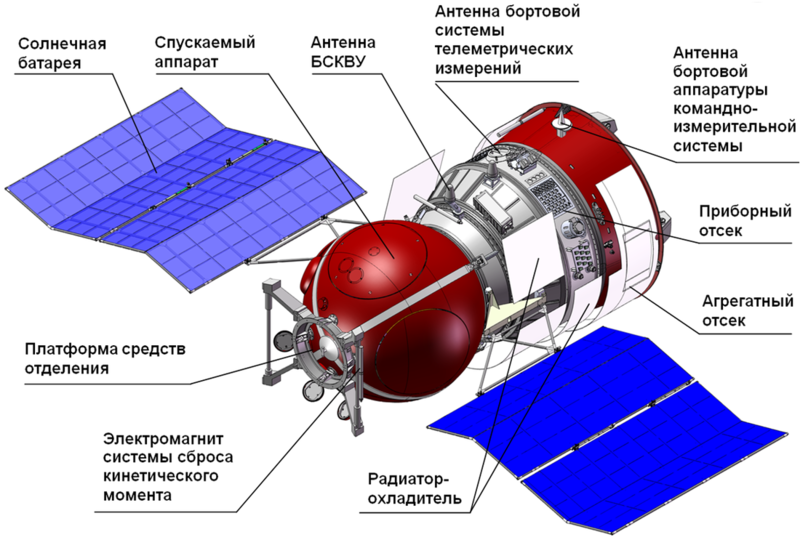 The Yantar bus was originally developed for the reconnaissance satellites carrying the same name, but has been modified to find applications in civilian Earth observation programs, modernized Kobalt military reconnaissance satellites and scientific satellites like Bion and Foton. The Foton-M satellites are manufactured by TsSKB Progress, Samara for operation by Roscosmos and foreign customers. Overall, the satellite stands 7.73 meters tall with a maximum diameter of 2.7 meters. Foton-M #4 has a mass of 6,070 Kilograms and could carry up to 600 Kilograms of scientific equipment inside the Re-Entry Capsule and 250kg of payload equipment on the outside of the spacecraft. The actual payload mass for the #4 mission is 420kg. 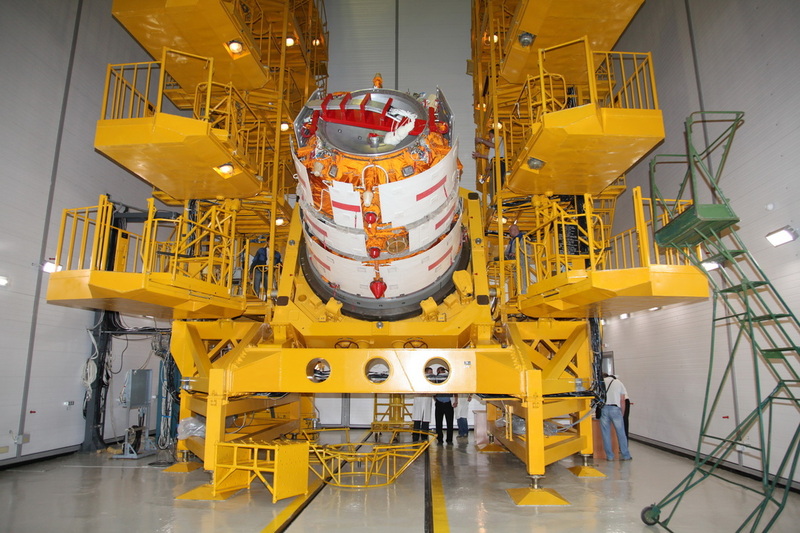 The Service Module and Re-Entry Module are connected via a structural interface as well as umbilical connections for the transfer of power, data and other resources. Two deployable solar arrays deliver power to charge the onboard batteries and operate the various systems of the spacecraft platform and feed approximately 900 Watts of power to the scientific payloads. 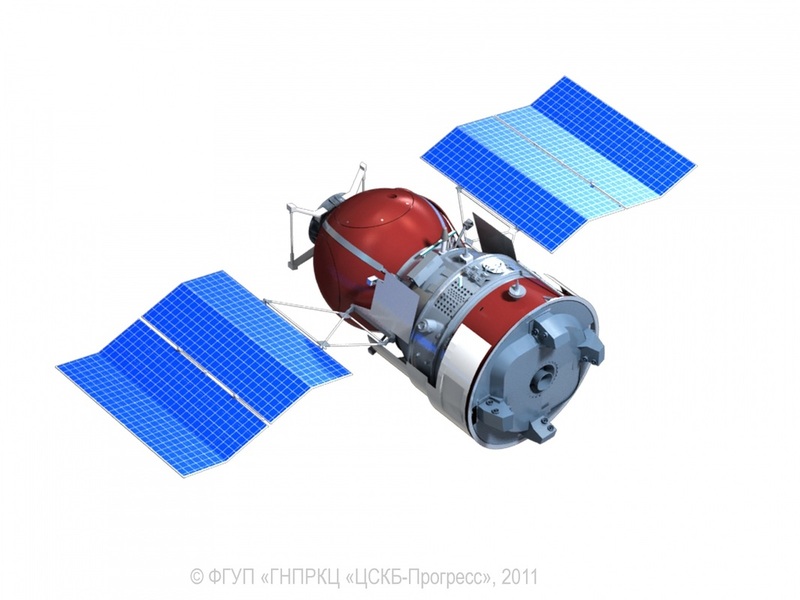 Assuming no changes of the Yantar Service Module for Foton-M, the satellite would feature a propulsion system that uses up to 900 Kilograms of Unsymmetrical Dimethylhydrazine and Nitrogen Tetroxide Propellants with Helium as pressurant gas. 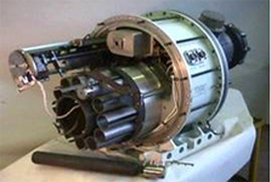 The propulsion system consists of a main propulsion unit used for impulse burns and a series of low-thrust engines for vehicle control. The main engine of the vehicle provides 2.94 Kilonewtons of thrust and the reaction control engines have thrust levels from 5 to 100 Newtons. For a normal mission, Foton-M will not use its propulsion system except for an optional orbit adjustment at the start of the mission and the deorbit burn. Frequent engine burns are avoided due to the strict microgravity requirements of the scientific payloads. After launch, insertion and stabilization, the motion control system is deactivated for the remainder of the mission until the preparation for landing begins. The spacecraft normally operate in a slightly eccentric orbit of 262 by 302 Kilometers that is optimal for a high-level of microgravity between 10^-4 to 10^-6 Gs, but Foton-M #4 will fly in a higher orbit at 575 Kilometers at an inclination of 64.9° due to its longer mission duration. The Service Module also includes instrumentation such as electrical systems, batteries, navigation equipment featuring a gyroscope unit, the vehicle’s communication system for command uplink and telemetry downlink. The spherical Re-Entry Module is 2.2 meters in diameter and offers an internal volume of 4.5 cubic meters to host the various payloads. Receiving power from the Service Module, the various payloads are connected to the 27-Volt main power bus of the satellite. 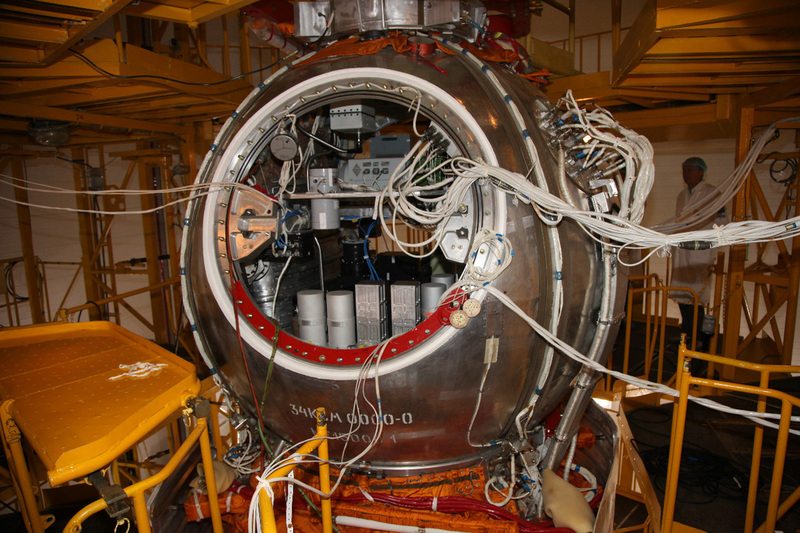 An environmental control system maintains the temperature inside the pressurized entry module that can be selected from +10 to +30°C while the operational pressure of the module can range from 46.7 to 152 kPa and is usually set at the normal atmospheric pressure on Earth. Thermal control inside the module is accomplished using a fluid cooling system that transports heat from the payload electronics to radiators installed on the outside of the vehicle. The payload electronics use conductive plates to transfer heat to the fluid loop. Atmospheric pressure is maintained via a pressurization system using Nitrogen and Oxygen gas. Foton-M is equipped with a data handling system that will collect and store payload data and provide a daily status summary that is downlinked to ground stations. This data will include health status summary data for both, equipment on the satellite and the payloads including any animals that are on board, monitored via imagery. Command uplink is normally done once per day and includes timed commands for the operation of the various payloads. 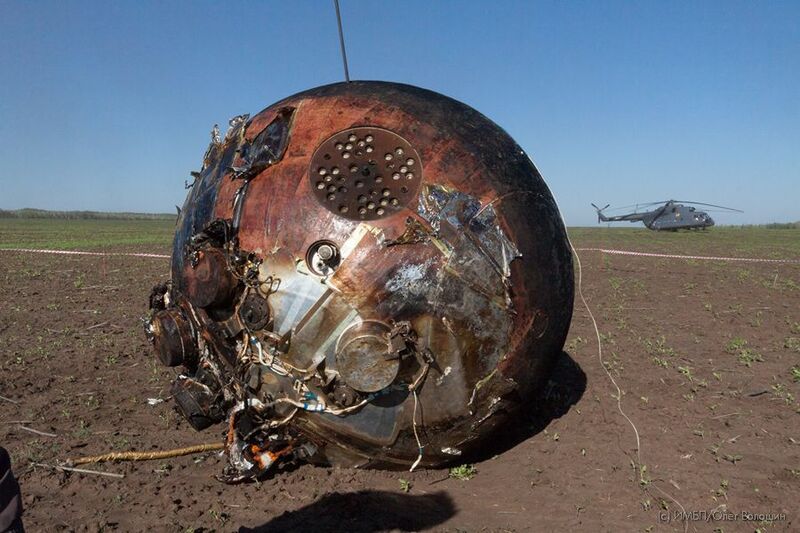 The Re-Entry Module closely resembles the Vostok entry module featuring a hatch for equipment transfer on the ground which is sealed before flight to create a heat shield covering the entire surface of the sphere. The Entry Module itself is not equipped with a thruster system and relies on its deliberately placed center of gravity to achieve the correct orientation during re-entry which is completed in a ballistic mode without active guidance leading to G forces up to eight or nine. A second hatch on the Entry Module protects the parachute compartment. This hatch is jettisoned after re-entry to allow the chute system to deploy the parachute to slow the vehicle down in the dense atmosphere. 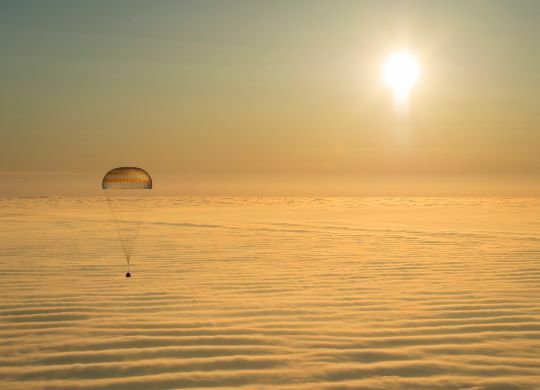 Under the main chute that deploys about three Kilometers in altitude, the spacecraft transitions to vertical flight. A soft-landing thruster system is initiated moments before touchdown to reduce the vertical landing speed of the craft to less than 5 meters per second. The Foton-M #4 satellite has been designed for missions up to 60 days. Previously, without solar arrays, Foton missions were limited to durations of around two weeks, the record being Foton-9 in 1994 with a duration of 17.6 days. The Foton-M #4 satellite carries a scientific payload consisting of a dozen experiment facilities inside and outside the Re-Entry module, hosting a multitude of experiments from different areas of science including physics, biology, chemistry, and materials science. The satellite also hosts a number of student payloads, listed in the table at the bottom of this page. The internal experiments are installed on panels and racks inside the Re-Entry module while the external payloads are attached to the exterior of the Entry Module. Three external experiment containers are used to host experiments that need to be exposed during orbital flight but protected during Re-Entry. This is accomplished using protective covers that can be opened and closed and seal the cavity of the experiment chamber for re-entry, protecting the hardware from the plasma of re-entry. Other payloads are installed outside these containers for the specific purpose of experiencing the re-entry environment. 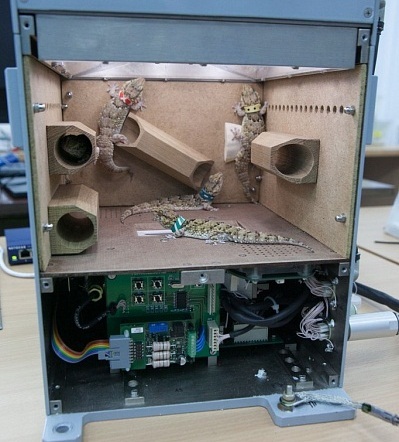 The Gecko-F4 experiment includes eight passengers to study the effect of microgravity on the body of adult animals with special focus on the skeleton. The sexual behavior of the animals will also be studied as well as the embryonic development. The five to eight Geckos that are being flown are part of the family that has already flown on the Bion-M #1 satellite last year. The species used is the Mauritius ornate day gecko (Phelsuma ornata) which can reach lengths of up to 12 centimeters. The experiment facility includes the necessary equipment to support the animals for the two-month flight duration. Ventilation systems are used to supply fresh air to the animal enclosure and remove carbon dioxide. The system also includes food supply for two months. Waste from the animals is removed via air flow to maintain the living conditions inside the experiment. Diurnal temperature & light variation is also provided by the experiment equipment. A video camera is used to film the geckos to allow the assessment of the animal’s behavior and sexual activity. Eggs will also be monitored using the camera system – at a temperature of 28°C, the young will hatch after 40 days which would fit into the mission duration for Foton-M #4. Post-flight analysis on the animals and eggs including histological and immunohistochemical studies will identify structural and metabolic changes induced by the space environment. Computer Tomography will be used on the animals to look at skeletal changes before and after the flight. 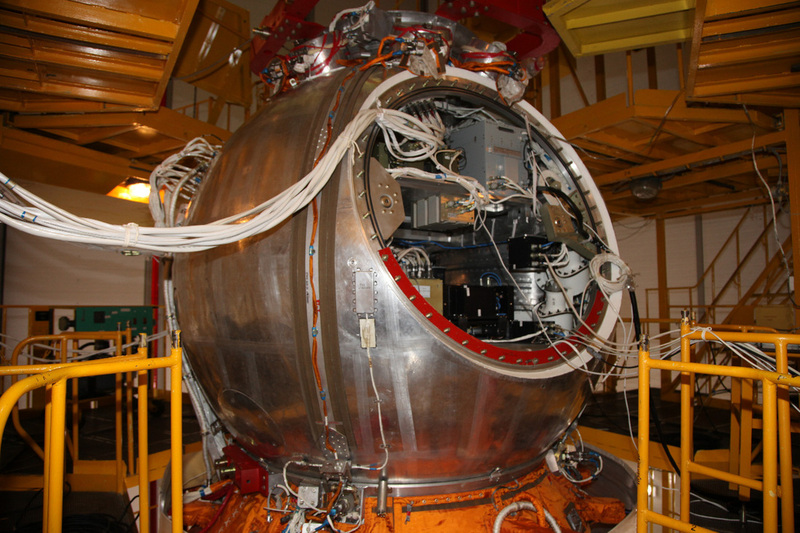 One of the high-profile science payloads flying on Foton-M #4 is the Polizon-2 electric vacuum furnace facility that will be used for a series of crystallization and heat transfer experiments, studying material properties for the production of new materials on Earth for a variety of applications. The Polizon-2 assembly weighs close to 200 Kilograms, accounting for a large fraction of the total payload mass of the mission. Polizon-2 includes 12 samples that can be inserted into the furnace via a sample exchange mechanism. The furnace itself includes a heating block with one heater for zonal melting and five heater for directed crystallization. Temperatures from 400 to 1200°C can be achieved with Polizon-2 with an accuracy of +/-0.5°C. Each of the sample containers is 45mm long and can be inserted into the furnace where it is heated using a pre-programmed heating profile to achieve the desired crystallization. The containers can be moved within the chamber at speeds of 0.15 to 1800mm/h with a total range of 334mm. 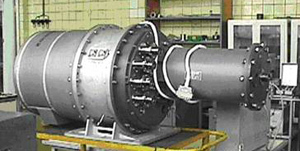 Additional equipment available for the experiment runs includes a magnetic inductor that can operate at different frequencies and a series of sensors needed to characterize the environment inside the furnace. Studies supported by Polizon-2 include Microstructure, Intermetal, Fuller ISSP and Uniformity. The Microstructure experiment looks at the growth of protein crystals using a highly directional crystallization method to yield crystals of biological macromolecules such as phosphorylase. This experiment will lead to new methods of producing such crystals for use in the development of medicine, including cancer drugs that act on a ribosomal level inside the cells. The Intermetal study will examine the crystallization of intermetallic alloys using directional solidification from the melt to refine existing models of the crystallization process. This will lead to a better understanding of the ongoing processes for the development of techniques to produce new alloys with desired properties. Fuller ISSP looks at the generation of crystals in microgravity consisting of fullerenes with a low density of structural defects. Fullerenes are molecules that are entirely composed of carbon capable of taking different shapes such as spheres, tubes and other spheres. One important form of fullerenes are carbon nanotubes finding application in materials science, electronics and nanotechnology. Better modeling of the formation of these materials can lead to new preparation techniques with implications for many industries on Earth. The Uniformity study examines the formation of germanium and gallium-antimony crystals with homogenous distribution to optimize the existing technologies and techniques of producing such crystals on Earth for application in semiconductors and photovoltaic converters. Another materials science experiment that uses the heating system is Kaliber which includes samples of gallium-indium, gallium-antimony and pure gallium for the assessment of the thermal characteristics of these alloys/metals undergoing phase transitions. The Vibrokon-FM experiment studies the use of controlled vibrations on the heat and mass transfer within liquid samples of different properties, also looking at crystallization and dissolution processes in microphase flow. This data will be used for the improvement of mathematical models to calculate the effects of microgravity on fluids, also improving industrial production in different areas. The Meteor experiment consists of four external panels that are installed on the Re-Entry module. These panels consist of different basalts with embedded microorganisms to study the effect of the space and re-entry environment on the organisms to explore the possibility of the survival of organic material on asteroids entering Earth’s atmosphere. Also, fullerenes are used as carriers for the organisms to assess the effectiveness of these compounds for future studies of this type. The Fluorite-P experiment launches cell cultures in a controlled environment to study the dynamics of changes in intracellular systems under the influence of spaceflight factors such as microgravity and radiation. The study includes measurements of the mitochondrial potential in the cells using fluorometry in-flight. Further parameters that can be measured with fluorescence spectroscopy include intracellular pH values. Additionally, the study includes experimentation at different temperatures to look at the cell regulation processes in space flight conditions. Biofrost includes a number of samples of microorganisms isolated from permafrost. This experiment is performed to confirm previously collected results on the impact of space flight conditions on the activity of the microorganisms. For that, the composition of the microbial complex will be determined before and after the flight accompanied by ground simulation experiments to isolate the effects of ionizing radiation on the samples. 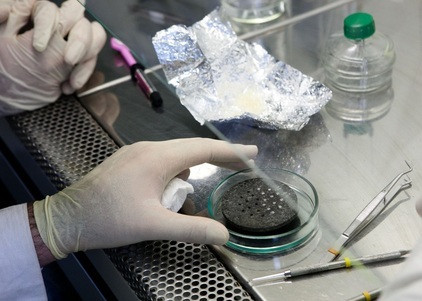 The samples that are flown were isolated from permafrost of different ages to identify properties that depend on the development stage of the microbial samples. Mycology is a study that examines the growth and development of a fungal culture and a fungal spore sample as well as symbiotic organisms in the space environment. Another microbiological study is Biotransformation, looking at the process of biodegradation of a biodegradable polyethylene film using microorganisms under the forced removal of metabolic products. This will yield valuable data for the development of degradable polymers for a variety of applications, also studying the chemical composition of the byproducts of biodegradation. 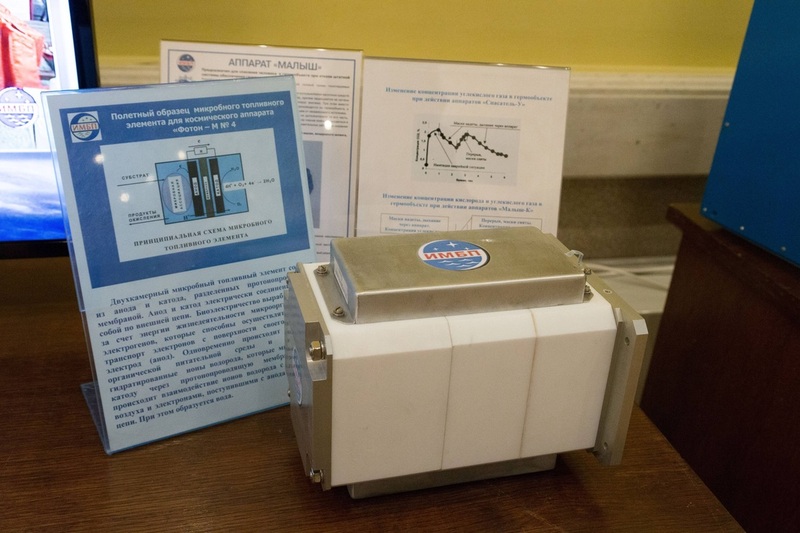 Bioelectricity is a prototype biological fuel cell that will provide data on the formation of biofilms on electrode surfaces in microgravity, the effect of microgravity on the potential of the fuel cell, the contribution of sedimentation processes on the voltage output of the fuel cell and explore the energy characteristics of bio fuel cells. The Bioradiation study exposes a number of organisms to the space environment that are relevant for scientific and industrial applications to assess the radiation effects on organisms. This includes studies with organisms that do not require any special life support systems for the duration of the mission such as dry seeds, silkworm eggs and a variety of microbial samples. 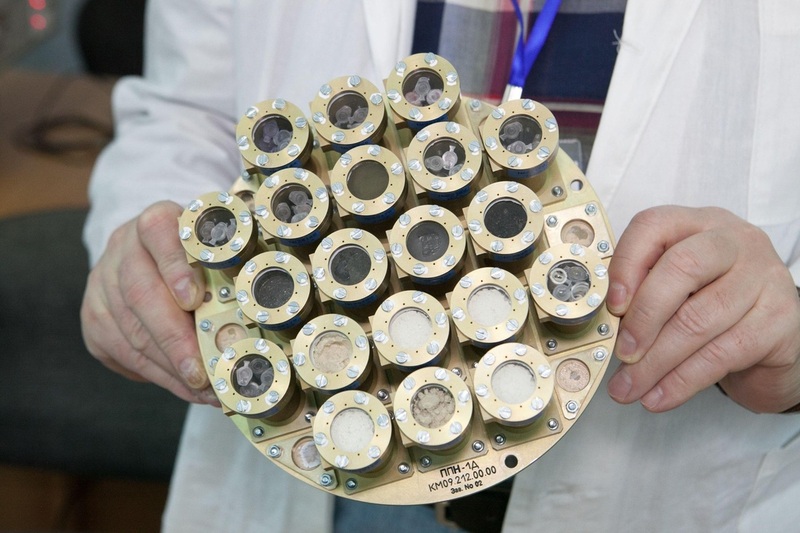 For the assessment of the radiation environment, Foton-M #4 is equipped with a number of different detectors and dosimeters using different methods to measure radiation to test the equipment and also provide scientifically valuable measurements of the radiation environment inside and outside the spacecraft for characterization of the findings of the various biological studies. part of family flown on Bion-M mission. effects of the space environment on embryos of reptiles. Samples inside and outside the spacecraft. processes in the spaceflight environment. of the space vacuum, radiation and entry environment. fungal symbiotic organisms in the space environment. in semiconductor fabrication processes on Earth. diffusion no possible in a gravity environment. in microgravity, looking at eutectic alloys. peptide and nuclide synthesis in organisms. 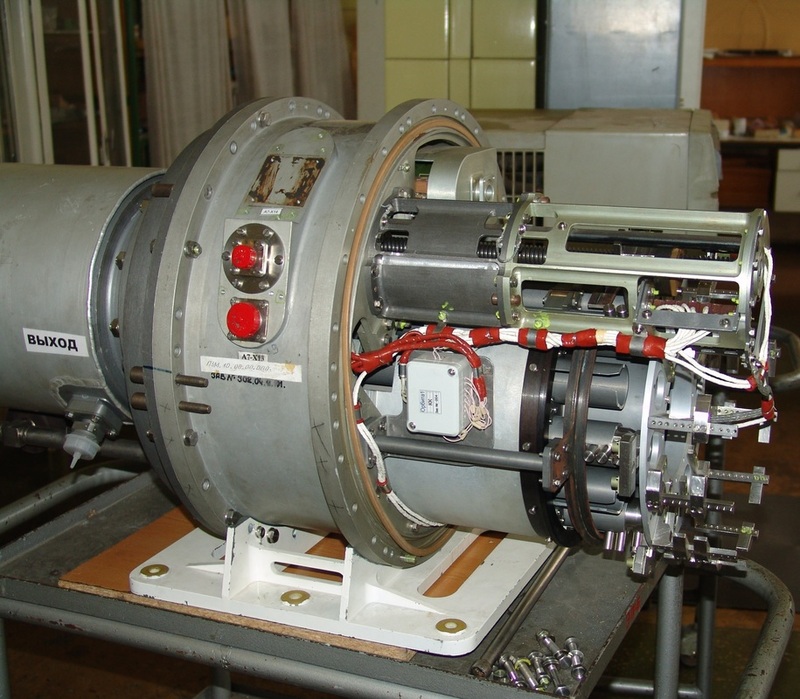 PPN-2K-F, PPN-ZD-F physics, radiobiology experiments, dosimeters. and outside the spacecraft during all mission phases. synthesis of porous composite materials.